Learn the proper way to figure out why the power keeps pooping out in your house—as well as when to let an electrician do the sleuthing. Q: Every few hours—sometimes minutes!—my living room and one side of my kitchen lose electrical power. Lamps won’t come on; I can’t make toast or watch television. I’ll check the breaker panel and, sure enough, a circuit breaker has tripped…again. I flip it back on and all is well until it happens again! I’m concerned about the wiring in my home. Should I call an electrician, or is there a simple DIY fix I can try first? A: While it’s frustrating to have to keep switching a tripped breaker back on, keep in mind that a circuit breaker is an important safety mechanism. Designed to shut off the electrical current when something goes wrong, it’s one of the best ways of protecting your home from an electrical fire. 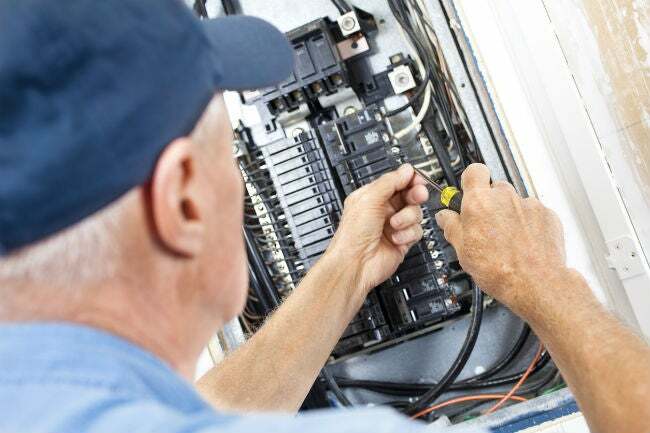 You may ultimately have to call an electrician to deal with whatever causes your circuit breaker tripping—electrical current isn’t something to mess with—but a little sleuthing will help you see if it’s something easily remedied. First, let’s review some basics to help you understand what might be happening. 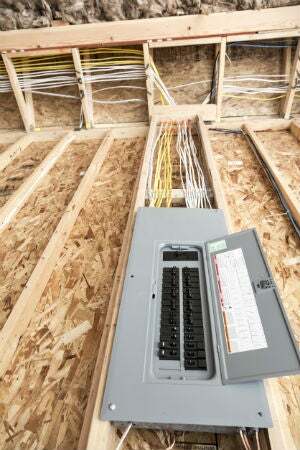 Electricity from your local utility company runs through a cable directly to your breaker panel (service panel). From there, the electricity flows through individual circuits (a circuit is a wiring loop that starts and ends at the breaker panel). Each breaker you see in the panel has an ON/OFF switch and controls a separate electrical circuit in your home. When a breaker trips, its switch automatically flips to the “OFF” position, and it must be manually turned back on in order for electricity to flow through the circuit again. Test for circuit overload. A circuit overloads when more electrical current is being drawn through the wires than they can handle, causing them to overheat and trip the circuit breaker. You mention that when the breaker trips, power goes out in your living room and part of your kitchen. This indicates that a single circuit is powering multiple outlets and switches, which is probably too much of a burden on the circuit. This type of wiring configuration is commonly seen in homes more than 40 years old, before we used a lot of electrical appliances and gadgets (big screen TVs, PCs, space heaters, and powerful kitchen appliances). To test for circuit overload, the next time the breaker trips, turn off all the switches in the affected area and unplug all appliances, lamps, and other devices. Flip the breaker back on and then turn on the switches and plug in/turn on devices one at a time. Wait a few minutes in between to see if the circuit will remain on. Each time you turn on a light or run an appliance, you’ll be drawing more electricity through the wires. If the breaker trips before you turn on all the appliances, try the experiment again, this time turning on the appliances in a different order. You may need to go through the process several times to get a good idea of how many appliances you can operate at one time before overloading the circuit. Circuit overload is one of the most common reasons for circuit breakers tripping, and you can prevent it from happening by running fewer appliances at the same time on that circuit. The best long-term solution, however, is to have an electrician update your home’s wiring to add additional circuits. In your situation, having a separate circuit to handle the part of the kitchen that’s now on your living room circuit would allow you to use your kitchen appliances (mixer, bread machine, toaster) without fear of overloading the living room circuit. Investigate for a short circuit. A “short” circuit means that two wires that should not be coming in contact with each other are inadvertently touching. A short can occur in an outlet, a switch, or within an appliance if wires are loose or damaged by mice or pets chewing through them. When an electrical short occurs, it triggers a sudden surge of electricity through the wires, and the circuit breaker trips. To find out if an appliance has a short, perform a test similar to the one you did for an overloaded circuit. When you plug in or turn on an appliance that has a short in its wiring, it will immediately trip the circuit—whether or not anything else is running. If you notice that using a specific appliance, such as your vacuum, trips the breaker every time you turn it on, try plugging it into an outlet in a different room. If the breaker for that room trips, there’s a short in the appliance. Don’t use the appliance again until it can be fixed, or you risk getting a shock. Because a short circuit can also occur in a wall switch or an outlet, if the breaker trips every time you turn on a specific light switch or plug something into a certain outlet, that indicates the location of the short. Electrical shorts in home wiring should be inspected and repaired by a licensed electrician; discontinue use of the switch or plug until the pro takes care of the problem. 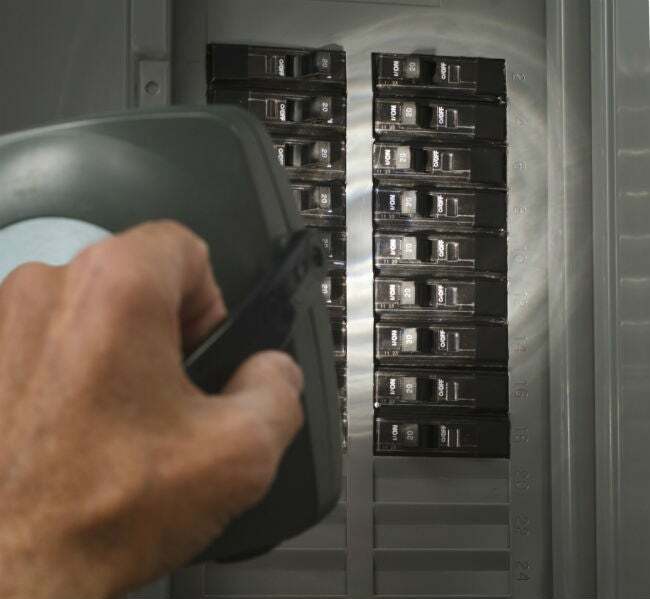 Call a pro to determine if a ground fault is why your circuit breaker keeps tripping. In the world of wiring, any time an abnormal surge of electricity occurs, it’s known as a “fault” or a “fault current.” In addition, electricity has an interesting way of seeking the path of least resistance to the ground. Benjamin Franklin found that out when he flew a kite in a lightning storm! A ground fault, also called an “earth fault,” occurs when the electricity running through your home’s wiring diverts from its intended path (the wiring loop) and travels via a different path to the ground. A ground fault can happen if water from a dripping pipe, leaky window, or other moisture source finds its way into an outlet or switch box. Water is a great conductor of electricity, and if it makes contact with wire connections or damaged wires, electricity can jump from the wiring loop and follow the water trail. This creates a surge in electricity and the circuit breaker will trip. Today’s building codes make provisions for the inclusion of ground wires that carry errant electrical current safely to the earth. The greatest danger from a ground fault occurs when a human becomes the path for electricity that’s trying to find its way to the ground, which can result in electrocution. This used to be a more common occurrence before the invention of ground fault circuit interrupters (GFCIs) outlets, which are now required in kitchens and bathrooms. When a GFCI senses a ground fault, it shuts off the electric current within a fraction of a second. If a ground fault is the problem, the cause of the errant water must be discovered and repaired, and any damaged wiring must also be replaced. In rooms where water is commonly used, if GFCI outlets are not present, be smart and safe by having them installed. Have an electrician pinpoint other possible culprits. It’s possible that a breaker in the breaker panel is undersized for the amount of electricity passing through the wiring loop. Or the actual wiring that runs to the outlets might be not up to electrical code, meaning it can’t carry the electricity without heating up and tripping the breaker. These and all other types of home wiring problems—aside from those explained in the sections above—should be inspected and addressed by a licensed electrician. According to the Electrical Safety Foundation International (ESFI), each year “thousands of people in the United States are critically injured and electrocuted as a result of electrical fires, accidents, electrocution in their own homes.” If you’re not experienced in home wiring, it’s well worth the $150 to $200 it costs to have an electrician come out and take a look.